American University of Sharjah (AUS) held a special ceremony November 1 to honor the academic achievements of 422 of its top students. The Annual Honors Convocation for the 2017–2018 academic year was attended by a large audience that included Dr. Björn Kjerfve, Chancellor of AUS, along with other senior university officials, faculty members, students and their families. The Honors Convocation recognizes and celebrates the achievements of students who attained a GPA of 3.5 in Fall 2017 and Spring 2018, qualifying them for inclusion in the Chancellor's List. In addition, the students must have been registered in a minimum of 15 credit hours, had no incomplete or failing grades in any courses and had no disciplinary action against them. In addition, four exceptional students were also awarded the prestigious Sheikh Khalifa Scholarship at the convocation. Out of the total number of students honored this year, 249 were female students and 173 were male. One hundred and eleven students received Gold awards, which represent being recognized at the Honors Convocation for the third or fourth time; 106 students received Silver awards, representing a second recognition; and 205 students were presented with Bronze awards for their first year on the prestigious list. The College of Engineering had the largest number of distinguished students represented at the convocation with 195 students; followed by the School of Business Administration with 116 students; College of Arts and Sciences with 59 students; and College of Architecture, Art and Design with 52 students. Four outstanding AUS students were also awarded the Sheikh Khalifa Scholarships. The scholarship is awarded to juniors and seniors and recognizes academic excellence, leadership potential, service to community, demonstrated talent in the field of study and participation in extracurricular and university activities. Given through an annual competition conducted within each college/school, it is granted for up to four consecutive semesters or until graduation requirements are complete. 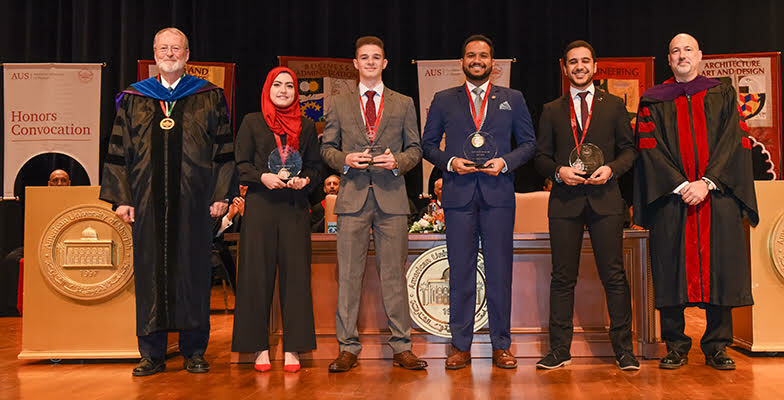 Winners of the Sheikh Khalifa Scholarships were: Saad Mohamed Boujan, College of Architecture, Art and Design; Kateryna Kadabashy, College of Arts and Sciences; Amro Mohammed Nedal Dajani, College of Engineering; and Zulfikar Qaidzohar Shahpurwala, School of Business Administration. The ceremony was followed by a reception for the students, their families, university officials and guests.